Enjoy taking baths but feel uneasy stepping over tall tub ledges? At U.S. Patio Systems, we offer a wide selection of walk-in tubs that make bathing comfortable and convenient for everyone. All of our top-quality walk-in tubs have many safety features built in, which help promote a more secure bathing experience for those who need it most. As a proud distributor of Safe Step Walk-In Tubs, U.S. Patio Systems offers customers an American-made walk-in tub that boasts best-in-class safety features and therapeutic advantages. With a low clearance step to enter the tub, anti-slip floor and seat and built-in safety bars, Safe Step tubs are designed for safety, convenience and ease. 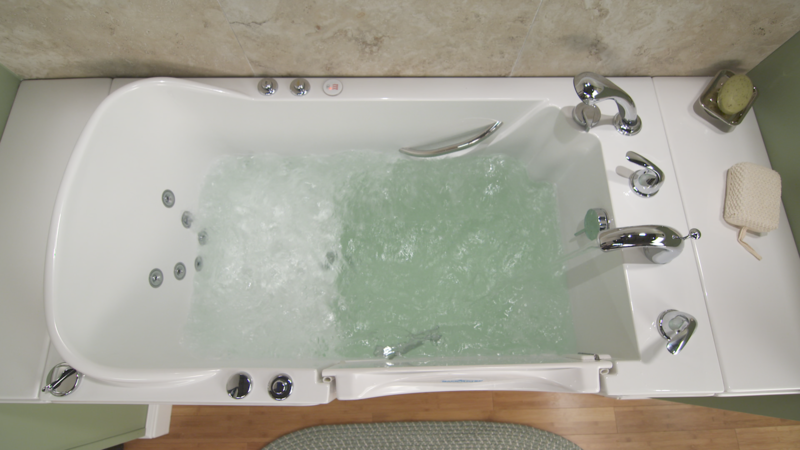 For those who may have difficulties stepping over and into an average tub, a Safe Step Walk-In tub offers exactly the features you need to bathe more safely! Additionally, Safe Step tubs feature air jet and water jet therapy systems that work together to provide you with the ultimate in relaxation and rejuvenation as you bathe. And with the heated seat and back in every tub that help to maintain the desired water temperature, you’ll never have to worry about feeling cold. Ready to start relieving your every-day aches and pains? Contact U.S. Patio Systems today, and learn more about the walk-in tubs that we offer!